We've had another successful photo identification on October 28, 2015! THE Ladies and Gentlemen of La Grange and Fayette county are respectfully informed by W. B. Clark, that his room is now open over Cavanagh's store, for a short time only. Those wishing a true and correct likeness of themselves or friends, are invited to give him a call. Lotto, F. Fayette County, Her History and Her People. Schulenburg, 1902. Walter A. Meiners (1873-1954) was a farmer and photographer at Waldeck. 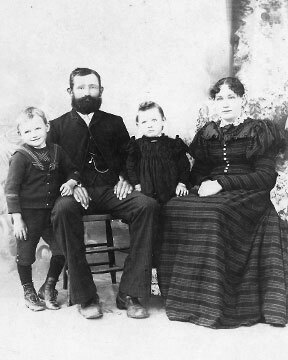 His grandparents were German immigrants Ricklef (1814-1902) and Anke (1816-1908) Meiners. His parents were John and Laura Weber Meiners. 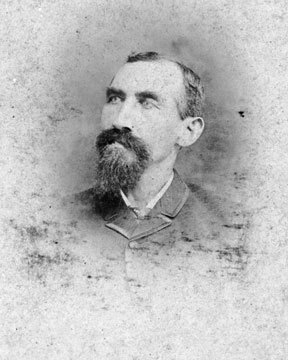 Walter Meiners was on the tax rolls as a photographer in Fayette County by 1898 and had a studio in a building separate from his home on his property. He is shown here on a card with his logo. His ornate wicker photographer's chair remains in the family. 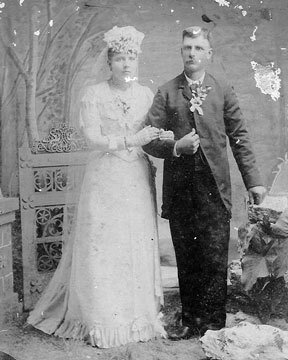 Meiners married Julia Heller Goerner in 1906 in Waldeck where they raised their family of five children. Haynes, David. Catching Shadows—A Directory of 19th-Century Texas Photographers. Texas State Historical Commission, 1993. This photo, found in a Victoria antique shop, has been identifed on 11/25/07 as Wilhelm H. Folterman, 1840-1921, who is buried in the Waldeck Cemetery. Thanks go to Judy Matejowsky for working on this one. 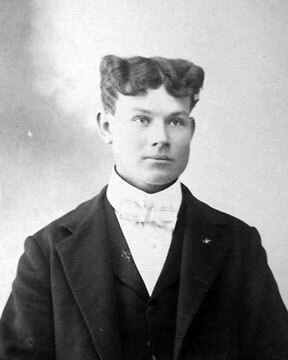 Arthur Nichols was born in Illinois in 1874. 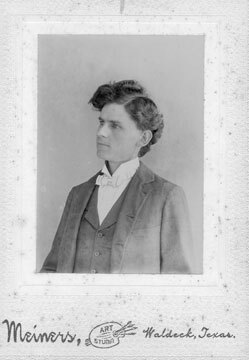 He appears on the tax roles in Fayette County in 1898, but was living in Austin County by 1900 where he had a photography studio in Industry. In 1907 Nichols took Louis O. Muenzler of Willow Springs as an apprentice. The following year Muenzler bought a house across the street from Nichols and set up his own shop. Nichols is still listed as a photographer inhis own shop in the 1910 census. In 1914 Nichols sold his studio building and home and moved to Columbus where he worked as a railroad machinist and later as a salesman. Industry-West End Historical Society. Historical Accounts of Industry, Texas 1831-1986. New Ulm Enterprise Print, 1986. Gathering of Fayette County Woodmen of the World camps. The communities of Cedar and Carmine can be seen on two of the flags. There is a large obelisk in the center of the photo and a band was present. Was this at a cemetery? Members of the Menking family were probably taking part in this gathering, which likely took place between 1900 and 1914. Please contact Sue Menking Standford if you have information about this photo. 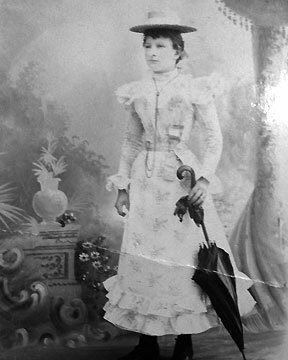 This young woman was a friend or relative of the Voelkel, Albers or Schuhmann families. 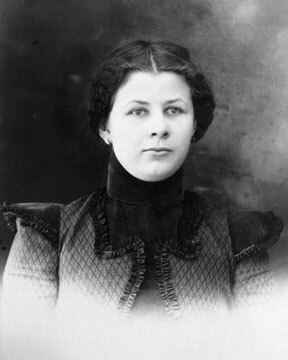 Now identified as Paula C. Albert Gruesen. She was the daughter of Johan "Carl" and Pauline Henniger Albert and married Pierre C. Gruesen. 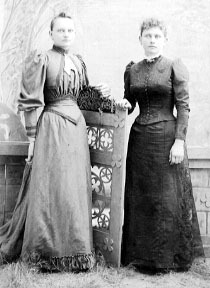 These are friends or relatives of the Menking family. 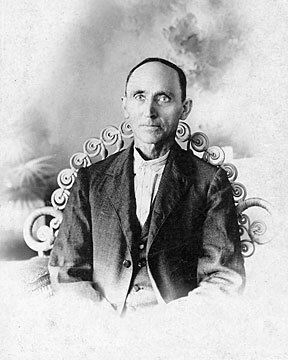 Born in 1870, Louis Melcher was one of the ten children of John Carl Melcher, a merchant at O'Quinn, and Wilhelmine Clementine Gebert. 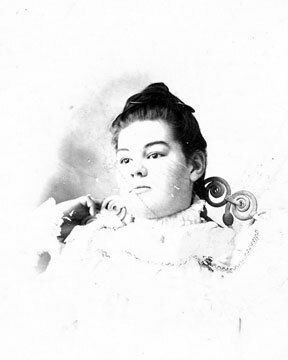 Louis married Ida Loessin and they lived at O'Quinn, El Campo, and Engle where he had a saloon. He was on the Fayette County Tax Rolls beginning in 1892. On April 28, 1892 The La Grange Journal reported "Mr. J. C. Melcher at O'Quinn south of Cedar is building an addition to his store which his son, Louis, will occupy for a photograph gallery." Melcher died at O'Quinn in 1948. Successfully identified by Sandy Otto! Ida married August Fahrenthold and Marie married Conrad Lindstrom. 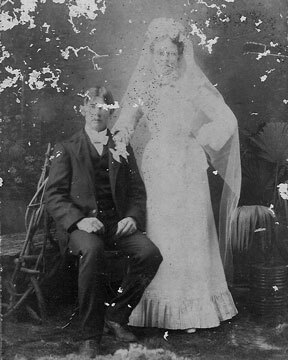 The photographer, Louis Melcher, was married to their father's first cousin.